This month approximately 20 of our members attended Quiltcon East. Quiltcon is a Modern Quilting convention held every year on alternating coasts. This year it was held in Savannah, GA.
Our members consisted of crew, volunteers, teachers, exhibitors, award winners and attendees. They took classes on paper piecing, alternate gridwork and hand sewing. They attended lectures and demonstrations. They were given the opportunity to walk to show floor and shop at the vendor booths. They also experienced all Savannah had to offer as well as other local areas such as Tibee Island. And of course, you can’t visit Savannah and not enjoy the delicious dishes and local flavors. Here are a few photos to enjoy from the event. 3rd place in Bee or Group Quilt Category went to the Mid Atlantic Mod progressive group consisting of Philadelphia MQG members Nicole Folino and Michelle Kochan as well as members of neighboring guilds: Laura Bennett, Jess Levitt, Neva Asinari, Colleen Wiest,Ashley Bander, Jessie Aller, Robin Tilsworth, Janet Schoenfeld and Tracy. We thank Jess Levitt for her incredible direction and Laura Bennett for backing, quilting, binding and submitting!! Member Sarah Bond’s taught her amazing flying geese class and had this lovely quilt on display at Quiltcon. We even had a fun Philly MQG meet up at a local river front restaurant! You can see all the winning quilts on the Modern Quilt Guild Site by clicking here. The next Quiltcon will be held February 2018 in Pasadena, followed by Nashville in 2019. 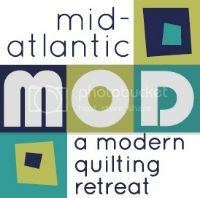 If you are interested in becoming a member of the Modern Quilt Guild, please contact us via email.